Kiyohara Yukinobu was the daughter of Kusumi Morikage and the grandniece of Tan'yu_, both renowned painters of the Kano school. While Kano school artists specialized in Chinese style brushwork and subject matter, by the 17th century they were also trained in the delicate style associated with the Tosa school, whose artists focused on indigenous themes--especially portraits of Japan's "Immortal Poets." Here, Yukinobu depicts Ono-no-Komachi (834-80), one of the "Six Great Poets" of the ninth century who was also celebrated for her beauty. Using extremely fine brushwork, Yukinobu rendered Komachi in the multi-layered formal robes worn by Heian-period court women. 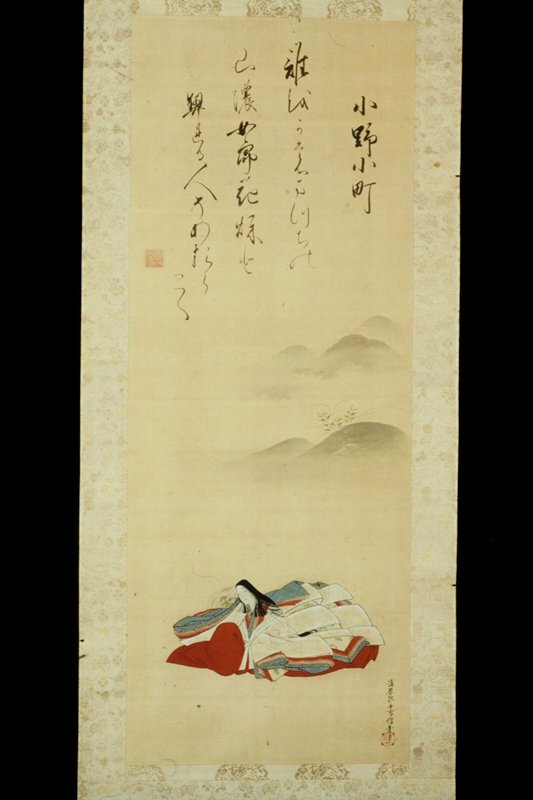 The poem above is identified as one of Komachi's own verses: I wonder for whom this blossoming golden lace waits on Matsuchi Mountain' He must have promised to return in autumn.